STEP ONE Lower spare tire for access to the winch mechanism attached to the lower side of the frame cross-member. 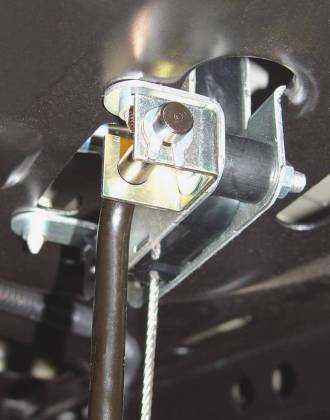 Insert the special black PVC bushing between the front and rear face plates on the right side of the winch mechanism. Install the U-bracket against the face plate using the provided 3/8" mounting bolt, flat washers and locknut. Position the U-bracket as pictured and tighten the mounting bolt.